Q – Can I hold a Mad Hatter event on a day other than Mad Hatter Day (10/6)? A – Yes, you can hold the event any time during September, October or November. Find our more and Register your Mad Hatter Drive here. Q – Do you accept donations and hats at other times during the year? A – Yes, we accept hats and donations throughout the year. Sign up for a regular event (not during September, October or November) by clicking here. Q – Can I set up an online donation drive and collect money through an online fundraiser? A – Yes, we have partnered with Fundly to collect funds online, and allow our volunteers to set up their own fundraising page. You will get your own link which you can send out to family, friends, colleagues, classmates, etc… and the donations go right to Hats Off For Cancer, but it is all shown on your page and we are able to track it through you. Donors receive gift receipts and confirmation emails for their records. Check out our Fundly page and click Become a Fundraiser at the bottom of the page to start your own online fundraiser for HOC! Q – Do you have any videos that I can show my class or office to explain more about your organization? A – Yes, we have produced a Public Service Announcement to help show how your involvement benefits children and teens with cancer. Check out our YouTube page for all of our videos, including a music video written and produced just for HOC as a tribute to kids and teens fighting cancer. Q – Do you work with any hospitals and camps in my area? A- We work with hospitals, camps, centers, and organizations all over the world. Here is a sampling of where we have sent hats. Q – If I cannot locate a local place to accept the hats, can I send them to you? A – Yes, you can send any hats that cannot be accepted locally to our national headquarters in the Greater Los Angeles area. You can send donations of hats and checks, cash or money orders (payable to Hats Off For Cancer) to: Hats Off For Cancer, c/o Tara Lawrence, 3615 Olive Street, Unit 1103, St. Louis, MO 63108. Q – Is there a local Hats Off For Cancer branch in my area? A – Our national headquarters is located in the Greater Los Angeles, CA area. However, we work with schools, companies, organizations, hospitals, camps, and centers throughout the United States, and in many other countries around the world. Q – There is a local child or teen battling cancer and I want to request a hat for them. Can I request a hat for them? 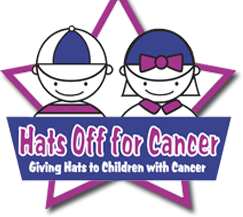 Q – I want to start a club at my school for Hats Off For Cancer and raise awareness and donations throughout the school year! How do I start? A – We have just started to launch our HOC school clubs! You can find out more information in our Get Involved section of our website. Q – Do you have lesson plans available for teachers to use during class when holding a drive for HOC? A – We do not have universal lesson plans yet, but we are working on it and happy to receive any plans that you may have used for your event. We do have bracelets, posters and stickers available. Find out more here. Q – Where does the money go that is donated? A – We are 100% volunteer organization, meaning that no one takes a salary. The money collected goes to purchasing hats for personal requests, shipping hats to individuals, hospitals, camps, centers and organizations worldwide, storing the hats, helping families of child and teen cancer patients, and administrative costs to help provide tools for groups to hold drives and events. Q – Is my donations tax-deductible? A – Yes, you are donating to a 501 c 3 nonprofit organization. Contributions are tax deductible to the fullest extent permitted by law. Our Tax ID number is: 94-3397263. Email us at info@hatsoffforcancer.org and we’ll answer your questions!